Walking along harbour quays you will now notice large white plastic structures shaped like rotating solids, fairly frequently on the rollbars of the larger boats, commonly known as "balloons" or "radomes". These structures are really just containers that in most cases have parabolic aerials inside them. Such aerials are the primary components of more complex systems for decoding and visualising information from orbiting satellites. A parabolic aerial can be compared to a "bowl" that collects the very high frequency signals from satellites located a great distance away from the Earth (tens of thousands of kilometres) and concentrates them in a single point called the "focus" of the aerial where a second element in the system called "LNB"is positioned. This device amplifies the signal received and reduces its frequency, enabling the signal to be transferred along a coaxial cable to another part of our system - the receiver". It can therefore be guessed that the size of the parabolic disc plays an important role in the quantity and thus in the quality of the final result: the greater the quantity of signal collected, the more intense the signal reaching the LNB itself will be, good for guaranteeing better audio and better video images. For a parabolic aerial to gather the satellite signals and transfer them to the LNB it must be constantly pointed in the orbital direction in which the satellite constellations gravitate. On land it is a simple matter to direct the aerial towards the fleet of Hot Bird satellites, which, located at thirteen degrees east, transmit Italian channels, both encrypted and not. 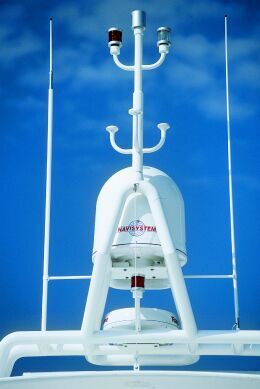 On boats the question is much more complicated; to compensate for movement caused by to rolling, pitching and yawing both special tracking systems and relative management software are necessary, which once the position of the satellites has been determined and recognised, are able to maintain the correct orientation of the parabolic aerial and in extreme cases of total signal loss manage to restore the link in the shortest time possible. There are tracking systems of various complexities: the most simple and economic just maintain alignment while berthed at the quay, while the most sophisticated, often of military origin, enable the satellites to be traced while sailing. The problem with the system is therefore that of tracing one satellite out of many basing on a special "ID" associated to the latter and constantly maintaining alignment with the same. This characteristic imprint, on first generation systems, derived from a series of special frequencies transmitted by the satellite that, once they are received by the system, univocally identify it. Now, thanks to digital technology it is possible to recognise each satellite based on the digital ID it transmits together with all the other signals and information, meaning that tracking errors are impossible. As already mentioned above, the larger the aerial the better the signal reception quality. There is however a minimum threshold of signal intensity below which the system does not work. The zone covered by the satellites, called "footprint" is made up of concentric areas with an irregular shape that give a gradually weaker signal as it passes from the central to the peripheral zones. It goes without saying that to be able to receive a satellite channel at the extreme edges of the "footprint" a larger satellite disc will be necessary to compensate for the lack of the signal itself. 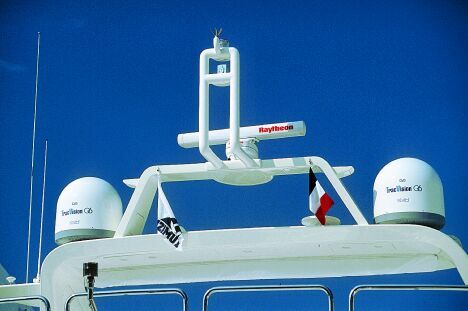 It is obviously impossible to install huge aerials even onboard boats of a certain size, even if with modern technologies a high standard of performance has been reached due to the excellent geometries of the discs and the improved performance of the converters that compensate for size. Therefore, once the channels of interest have been established, it is necessary to examine the zones covered by the satellite that transmits them and evaluate if an aerial of a size compatible with that of the boat is adequate for the zones in which the boat sails. Bearing in mind that Italian channels are mainly transmitted by the Hot Bird fleet, it is helpful to remember that each satellite has its own footprint, so in determined zones it will be possible to receive some channels at the expense of others. 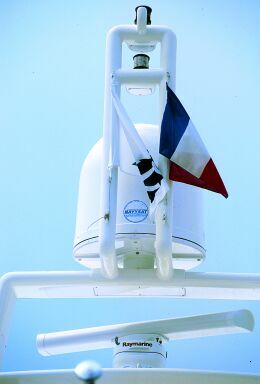 The system on board must therefore be able to recognise and track the different satellites tracked on at least the Mediterranean basin, as some Italian channels are duplicated and transmitted by some of these (for this purpose it is possible to consult the internet site www.satcodx.com to check on channels and cover). The interface between the aerial/LNB group and the video is a signal decoding instrument called receiver. The receiver can be either analogue or digital and may include a "decoder", an instrument useful for decoding encrypted transmissions. Although some systems still need analogue receivers for tracking the satellite, digital receivers are currently the most widespread, "Gold Box" models in particular are at present those most marketed on the wave of Pay TV. It is also expedient to add that despite the fact that some channels are not encrypted, that is they do not need any special decoders, other programmes may however be encrypted for reasons linked to payment of transmission rights in the different zones covered. If you should just happen to want to take a trip to the Caribbean from the Mediterranean, it might not be possible to use the television system there because of the different polarisation of the signals emitted by the American satellites. In fact, while in the Mediterranean the electromagnetic waves have linear polarisation, in America the waves have circular polarisation. To be able to receive these signals you will have to replace the existing LNB and the receiver connected to it. 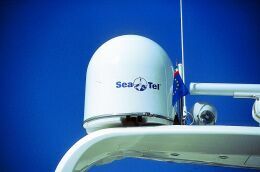 Several "satellite" providers have been created recently, which have elaborated a link up system to Internet that, when downloading using a device called "satellite modem" that takes advantage of the considerable bandwidth guaranteed by the television satellites, permits the reception of a considerable volume of data, while when uploading it exploits a standard terrestrial link, a telephonic twisted pair or any mobile phone or even a satellite terminal. So, through Astra or Hot Bird large volumes of data can be received in a short time. This approach, given the low speed of data exchange and the high operative cost of normal satellite systems, can be considered a small step forward in technology, even if it has some limits. The initial link, in fact, is set up using very slow devices, restricted by the network cover (for GSM) or that work at a "baud rate" so low (see some satellite systems) that it is necessary to consult your Internet provider to find out if it supports this transmission speed. Furthermore the instructions given by your station are sent to the land provider server, bounce back to the satellite provider server and are finally sent to the satellite. These passages slow down surfing on-line considerably, while they do not have any effect on downloading files or large programmes. Some satellite providers offer an interesting possibility - that of being able to book the web pages in advance and then receive them updated at your workstation at a pre-set time, without having to connect to the network. Naturally, the rules regarding satellite coverage defined above are still valid, being conditions that cannot be ignored for correct working of the whole system.